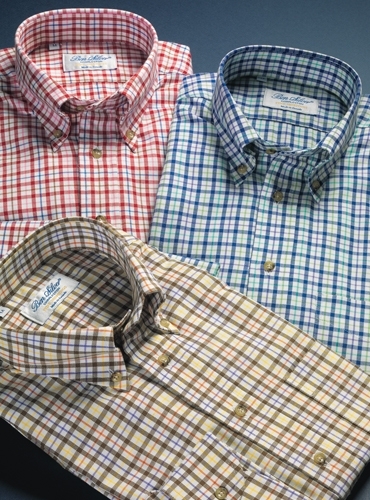 Three wonderfully comfortable and handsome brushed cotton plaid button down shirts from this season’s collection, each ideal for sport or under one of our jackets. 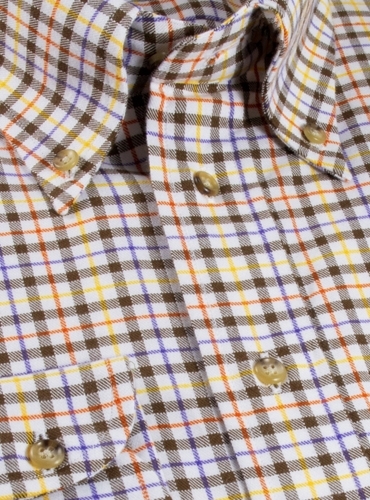 These traditional cream ground plaid button downs in classic colors are sized M–XXL. Featured in gold. Also available in: 702-ruby; 704-blue. *Based on the European size 40CM, the perfect fit when 15 ½ is too snug. We are proud to cut only the best Italian and Swiss woven fabrics — assuring quality, comfort and durability. We continue to set high standards for construction — all shirts are cut full, in a gentleman’s fit, with a roomy sleeve. The range of collars assures a choice to suit every gentleman. An extra ⅜" is added to the collar and 5⁄8" to the sleeve to allow for shrinkage. All shirts feature removable collar stays, two piece collars, and gauntlet buttons, as well as sturdy buttons throughout. 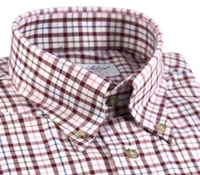 Our shirts are beautifully sewn with hand-stitched collar, sleeves, yoke, front placket and buttonholes. There are 22 stitches per inch and side gussets for strength, and ¼" stitching on collar and placket. 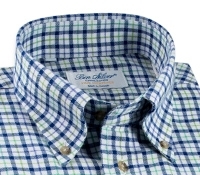 The button down collar is non-fused and cotton lined, with a perfect roll. The spread collar fits comfortably and is deep and wide enough to lie properly under the lapels of a jacket. Every collar is designed with the proper tie space, thereby eliminating the dreadful appearance of a “gap” between the tie and the shirt collar. French cuffed shirts are beautifully finished, and the button cuff has a 2-button closure for an elegant look and extra comfort over large watches. All of our shirts are cut in small American, English, Italian or French artisan workrooms. 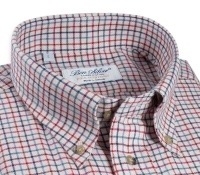 All shirt collars are available in typical ½" size increments, as well as the unique 15¾" neck size — an especially useful addition! 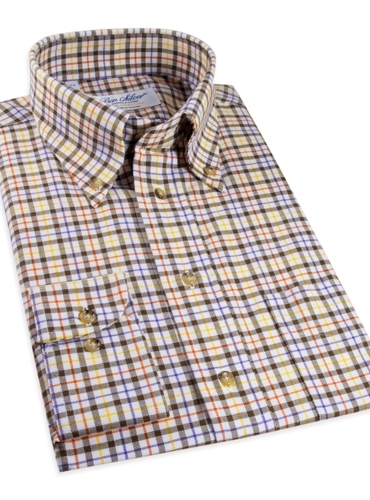 All of our shirts are cut from 2-ply classic woven fabrics, in up to 220’s thread count! These fabrics are soft, luxurious, and comfortable, without compromising durability. The patterns — stripes, checks, plaids, tattersalls, and interesting solid twills or other weaves — are all classic in the American and British tradition.